Catholic Relief Services held its seventh annual ICT4D Conference in Chicago, Illinois. The conference explored methods for systematically integrating information and communications technology innovations into relief and development programs – innovations that enhance program quality, improve decision making, and increase impact. Conference roles: This conference focused on sharing experiences in the use of technology in development with speakers (165) and exhibitors (9) making up 46% of the total participant population. Geographies: Participants came from 55 different countries around the world – 63% from the US. Organizations: Representatives of 140 organizations attended. Representatives of international and local NGOs made up the largest portion of the attendees (58%) followed by technology companies and other businesses (25%), universities and colleges (12%) and, governmental, multi-lateral organizations, and foundations (5%). Disciplines: 40% of the attendees were either IT specialists or associated with a technology firm. 60 % were from other disciplines (9% of whom were monitoring and evaluation specialists). Roles: 52% of the attendees were managers (13% of them C-level and Vice Presidents). 48% were technical specialists. A post conference survey indicated a high level of satisfaction with the conference. 97% of the participants rated the conference good, very good or excellent and indicated that they were very likely to recommend attendance at future conferences to their colleagues. 99% rated it good, very good or excellent value for the money and indicated it was very relevant to their work. All attendees indicated that they received value out of attending. The ability to network, learn and share experience – both challenges and successes. Meeting people and expanding their personnel network. Increased focus on preparing presenters. Two challenges ran in conjunction with CRS’ 2015 ICT4D Conference. This challenge, sponsored by ESRI, had participants use ArcGIS Online to apply geospatial analysis tools to answer questions about the Ebola crisis in West Africa that can be impactful to response efforts. 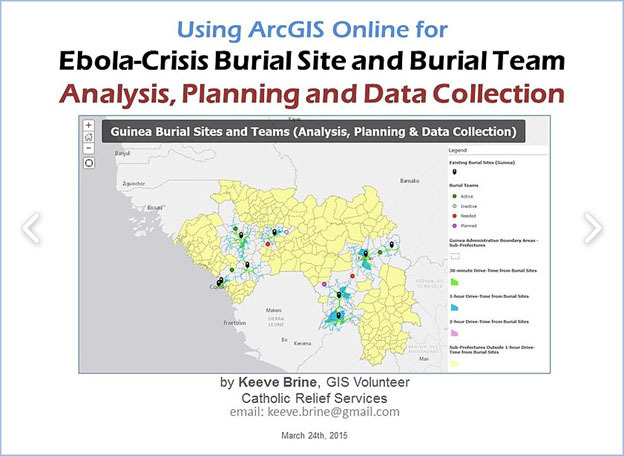 The winning entry was Using ArcGIS Online for Ebola-Crisis Burial Site and Burial Team Analysis, Planning and Data Collection submitted by Keeve Brine. This challenge, sponsored by Zerion Software, had participants use the iFormBuilder mobile platform and any object, sensor, device, or component in the Internet of Things to create an innovative, unique, and value-added solution to a problem facing the International Relief and Development Community. The winning entry was Monitoring Vaccine Refrigeration submitted by a team of IT professionals from the University of Notre Dame’s Office of Information Technologies: Kevin Casault; John Grover; Tom Marentette; Matt Willmore.